A regional election has gone badly wrong. Dissecting the Kremlin’s defeat in Primorye shows paths for Russia’s future. 18 September: election protest in Vladivostok. Viktor Ankov / RIA Novosti. All rights reserved.This decision by Russia’s Central Election Commission is unprecedented. Falsifications and ballot-stuffing have long been common place at Russian elections, but there’s never been a case of election results being cancelled. This is understandable: elections are manipulated in the interests of Russia’s “party of power”. The remaining participants in the elections are far from angels and are also happy to engage in ballot-stuffing in their favour, but to expel election observers from polling stations with the help of the firefighters and engage in trickery at the level of election commissions, you need to have access to the heights of the Russian authorities. This is the reality of the gubernatorial elections in Primorye, in Russia’s Far East. But why did the Russian authorities opt for such radical moves, and what is really happening? The main point is that Andrey Ishchenko, the Communist Party’s candidate for governor, has had his election victory stolen — twice. Initially, during the vote, and then in the ensuing administrative process, in which the election results were cancelled, and all votes, not only false ones, but honest ones, were annulled. The annulment of these elections could seem like a good move to some. Indeed, a move that testifies to the sincerity of Central Election Commission Chairperson Ella Panfilova’s statement on the honesty and transparency of the election process in Primorye. But in fact, this decision by the Central Election Commission is just another manipulation in service of guaranteeing that power lies in the hands of Kremlin appointees. Let’s look at the situation calmly: there were no questions on the validity of the results of the first round in Primorye — at least because the United Russia candidate Andrey Tarasenko, supported by Vladimir Putin, won with a significant margin. The scandal began in the second round when the Kremlin’s man began to lose, but who then won in the final vote count — only after all kinds of machinations were carried out in front of the entire country and clear evidence of 24,000 votes (Panfilova’s number) being fabricated. If this is only about the second round, then the way out of this situation is clear: the second round of Primorye elections should be cancelled, and a re-election or re-count needs to be held, after the 24,000 fabricated votes have been excluded (the Central Election Commission confirms that they are invalid). Given that there are few illusions regarding the independence of the Central Election Commission, why did the authorities opt for a different path (cancellation)? 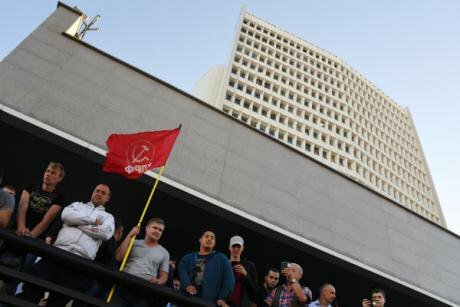 Because a re-count of the second round would lead to Andrey Ishchenko’s victory, and they would have to award the position of governor to the Communist Party candidate. This kind of scenario is impossible in Russia today. In a working representative democracy, elections are an open and transparent mechanism of distributing power between those who want access to it and those have the lawful right to it. To make this mechanism work, you need a consensus in society that elections are held honestly. Then, with the help of transparent election procedures, you can find the most popular candidate among the electorate, who then receives power for a certain time and according to a certain procedure. Importantly, this person receives power even when the real institutions of power don’t like the candidate. In Russia today, all that’s left of this complex construction are nice names for institutions and carefully reproduced rituals, which are displayed eagerly to foreign observers on election day. See, these are our candidates, these are our voters, here are the ballot boxes, the ballots — everything’s the same. Meanwhile, placing your ballot in the box in Russia has nothing in common with elections in the west for the simple fact that it bears no relation to the real distribution of power — which is exactly what we are witnessing in Primorye. Everything that happens after that — the primaries, election campaign, voting, the count — has no practical meaning. In effect, these procedures are important only for low-ranking public officials and other figures interested in good relationships with the future governor. This is how they demonstrate their commitment to the president’s chosen one, their readiness to work with and for them, their ability to mobilise and finance important projects. In Primorye, this scheme broke down: the candidate, who had been confirmed at all levels and personally supported by Putin several days before the second round, could not bring the campaign home and organise his legalisation as governor of the region. This alone is fairly shameful, and makes you think of the lack of popularity, talent and general capabilities of the authorities’ candidates, who are unable to win even when the whole state apparatus and president is working for them. That said, there are also objective reasons that influence this situation. Andrey Tarasenko is no worse than than the majority of other governors who have won and continue to do so in Russia. It’s just that several tendencies came together in his case — the general decline of the authorities’ popularity, specific problems in Primorye and the unexpected stubbornness of his opponent. To recognise Andrey Ishchenko, the Communist candidate, as the victor after the results were announced or even after a recount would mean setting a precedent. It turns out that, after destroying a candidate who was personally supported by Putin, a regional politician can still ingratiate himself with the president in the form of a partner and employee. This is why the decision was made to declare the elections void, winning the authorities three months to work on the situation further. The Presidential Administration can now find itself a stronger candidate and guarantee them a win at the elections, especially if the Communists are pressured into putting forward someone more cooperative than Andrey Ishchenko. In the end, they might even let Ishchenko win, but only as a Kremlin candidate — one supported by the president and who has publicly committed to Putin. This is also possible, especially given that Ischenko is yet to tire of stating his loyalty to Putin. The main point here is to demonstrate that the principle that it’s not the elections that are important, but the Kremlin’s position. After all, they always decide who gets power in the regions. The elections are secondary: this is why they can be falsified, cancelled, held again — until their results suits the country’s main voter. Still, this situation has revealed something truly important: the myth of Putin’s unassailable popularity and the all-powerful nature of the power vertical has begun to crumble. Until recently, Putin’s personal support for a gubernatorial candidate, particularly during a presidential visit to a region, was considered a guarantee of success. In Primorye, this scheme has broken down once again. If the Kremlin has had to falsify the results of an entirely controlled election process with carefully chosen opponents, then cancel them amidst a mood of public shame, then does this mean that president Putin and his regime are, in fact, as popular as we are led to believe? If the Russian people love him as much as the propagandists claim, then why didn’t his personal support for Primorye governor Tarasenko a few days before the vote lead to a victory in the first round? After all, voters in Primorye knew exactly which candidate the president wanted them to vote for — so what forced them to vote differently? For many years, elections have been carefully transformed into a ritual which should demonstrate the unity of the Russian people around their irreplaceable national leader. It’s a few months since Putin’s triumphal re-election, and the regional elections have shown that a) this unity doesn’t exist and b) that a loyal electorate is ready to vote against clear signs from above. If this tendency continues, then each new round of elections is going to cost the authorities more and more in terms of organisational costs and moral losses. This is the dilemma before the authorities: either they have to make the elections competitive and open, at the same time giving them some kind of practical meaning, or to move in the direction of the final pushback against democracy. In the first case, the authorities will have to resign themselves to the fact that certain politicians will start appearing in parliament and other state institutions (and that they’ll have to start negotiating with them). In the second, they’ll have to admit to their own lack of popularity, which, in the long-term perspective, will mean defeat — only a complete and final one. Unfortunately, there’s little hope for the first option: Putin doesn’t like losing, even in trivial matters, so we’ll have to wait for further crackdowns, expanding repressions against dissidents, and new foreign policy adventures — all the initiatives that are necessary for justifying dictatorship. In any case, Putin will not forgive the residents of Primorye, nor Russia as a whole.